Leading indicators are indicators in the economy that can be used to predict economic activity before it occurs. These indicators are important to economists as it allows them to use information from the economy to predict and manipulate aspects of the economy in order to prevent market failure. 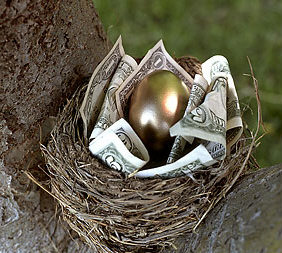 Certain leading indicators include stock changes, changes in debt and money supply in an economy. 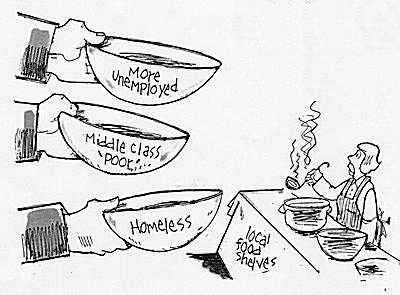 Lagging indicators are indicators in the economy that follow economic activity. While these indicators cannot be used to predict economic activity, it can be used to reflect upon the effect on economic changes. This is important as it allows economists to see the effects of economic changes in order to predict how to prevent these effects in the future. Lagging indicators can include changes in interest rates, changes in consumer price index (CPI) and unemployment. 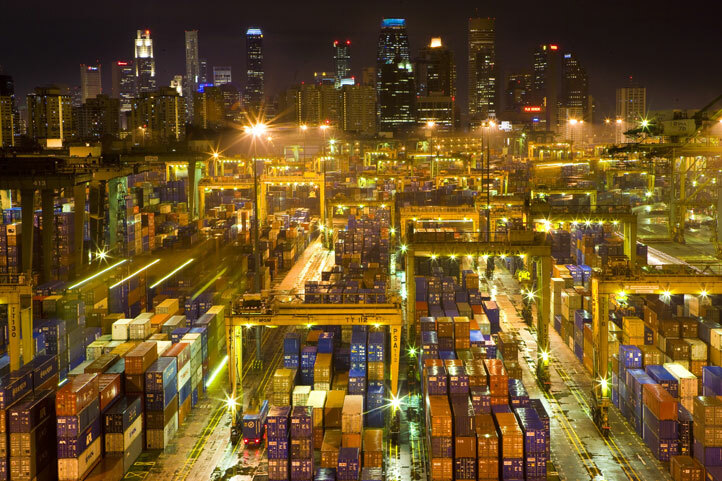 According to this Topnews article, an increase in demand by Singapore’s trading partners has resulted in an in increase in Singapore’s aggregate demand. The aggregate demand of a country is the entire demand for all firms and companies in the economy.This increase in aggregate demand is due to the increase demand by Singapore’s trading partners, as Singapore is now required to export more. In order to increase exports Singapore must increase total production. On a graph this can be represented as a shift along the production axis, as shown in Figure 1. As demand for Singaporean exports by foreign trade partners increases, Singapore undergoes an increase in production. 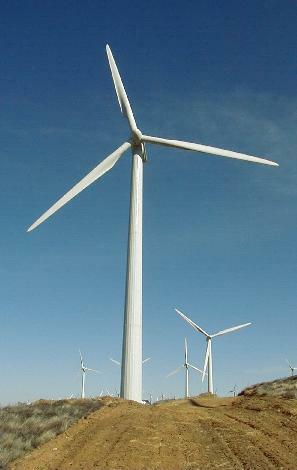 Q1 represents production prior to the increase in foreign demand. Q2 represents the final production in Singapore following the increase in foreign demand. Here we can see that there is an increase in production from Q1 to Q2 due to the increase in aggregate demand. 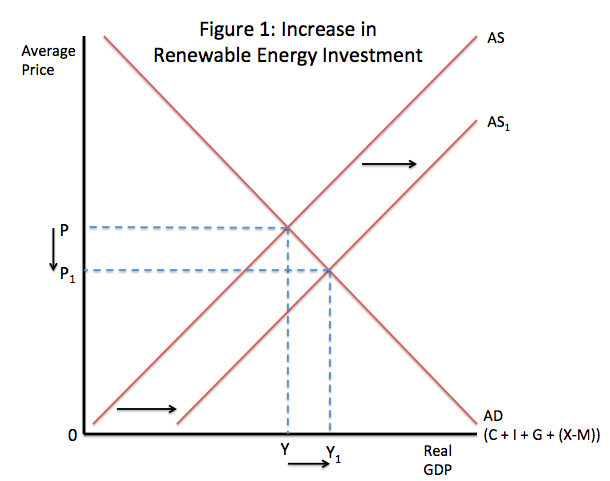 This increase in aggregate demand, or AD is represented by the shift from AD1 to AD2 in the diagram. 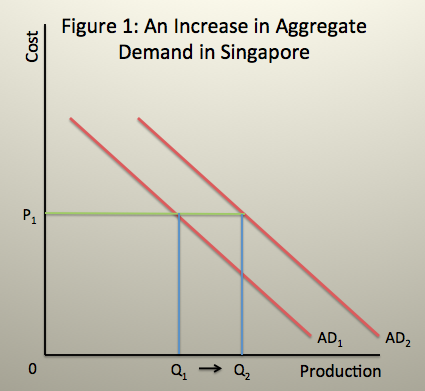 AD1 represents the aggregate demand in Singapore prior to the increase in foreign demand for exports. AD2 represents the final aggregate demand in Singapore following the increase in foreign demand for exports. Here we can see there is a clear shift right along the production axis, resulting in the shift from Q1 to Q2. Along the Cost axis however, price for the exports remains constant at P1.